A total of 105 students and staff volunteered to donate but about 40 were unable to do so for various reasons. It is typical for some donors not to qualify for donating blood, Toole said. Sometimes the person’s iron may be too high or too low, causing the blood to be useless. Traveling to certain countries, such as Mexico, may disqualify a donor, he said, because of the risk of malaria. Health problems that call for using certain medication or antibiotics can cause a donor to be unable to give, Toole said. The blood received from OCCC will be given to local hospitals to help save lives, Toole said. 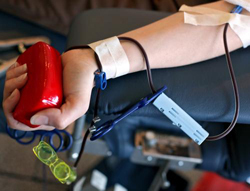 One blood donation can help up to three people, according to the OBI web site. Founded in 1977, the Oklahoma Blood Institute is now the ninth largest non-profit blood center in America with more than 125,000 donors a year. OCCC holds several blood drives annually, but this was the last drive for the year. Next year’s blood drives will be announced at a later time. For more information, contact the Student Life or visit www.occc.edu/studentlife.